China is a veritable wonderland of weird people and even weirder animals. Snake with a foot? You know it’s from China. Alien fish monster? Found in a cave in China. Village of midgets, dwarfs, and other wee folks? China all the way. 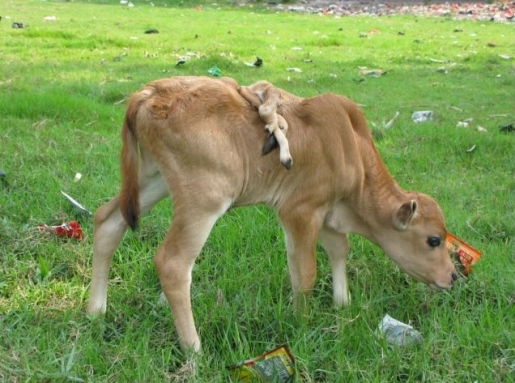 And now, joining China’s menagerie of monsters and freaks is a six-legged calf, which was born in Leizhou, in the southern province of Guandong. Now Fish Boy can have a pet of his very own! People can blame this on any number of things: air pollution, water pollution, conjoined twins, simple freak of nature… but here’s what’s up. This is actually a test cow. That’s right, this is all part of KFC’s plan to breed a six-legged mutatochicken. Once they perfect the genetic mutation on cows (to keep people like me from uncovering the plot), they’re going to cross that technology over to poultry DNA and then bam, that’s a one-chicken extra-value meal. You’re not fooling me, Colonel Sanders!